This is the most popular type of banner and has a multitude of uses at a variety of events, such as, building site banners, advertising banners, street campaign/event banners, corporate event banners, sporting event banners, birthday banners, party banners, etc. 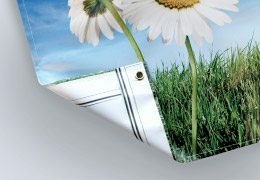 The material can also be used for single-sided banners, giving them a supreme quality feel and extra strength. Banners will be given a welded hem, then eyeletted at equal distributions along the hem. The standard distribution of eyelets is one per metre. If you require a different distribution or specific placement of eyelets, that’s no problem at all – simply let us know what you need when you place your order.